COEUR D’ALENE — Hope Orozco personally knew her Coeur d’Alene High principal. He was a close family friend and the best man at her uncle’s wedding. When he committed suicide, she was shocked. People around her were devastated. It didn’t make sense. Then, in a matter of months, three more people connected to the Coeur d’Alene School District community took their own lives. “I learned suicide isn’t so far away,” said Orozco, a junior at Coeur d’Alene High. Coeur d’Alene High junior Hope Orozco shows off a mural created by classmates during a team-building exercise. Coeur d’Alene High School Principal Troy Schueller took his life on March 21, 2018. Just weeks later, retired Coeur d’Alene teacher and Idaho Hall of Fame basketball coach Dean Lundblad took his life. Then, within a month, the unthinkable — two teenage students committed suicide. The series of tragedies was a crushing blow to this North Idaho school community. Something had to be done. Something had to change. Now. So school leaders sped full throttle into implementing a wide spectrum of support. They pulled in help from local and national resources and purchased and installed four mental health and wellness initiatives. This wasn’t just about suicide, though that was a driving force. Prevention and intervention programs were initiated to combat drug abuse, stress, poverty, homelessness and depression, said Coeur d’Alene’s public information officer Scott Maben. “We’re being pretty aggressive about bringing in programs that work and we customize them,” Maben said. Coeur d’Alene patrons also stepped up to help, comfortably passing a two-year, $40 million supplemental levy earlier this month. The levy was increased by 25 percent from the previous one and a big chunk will go into mental health, Maben said. The district plans to hire a mental health coordinator and additional counselors for some of the schools. “After last spring, we made a commitment to expand what we were doing,” Maben said. The most interactive initiative is an “up-stream” or preventative program launched in January called Sources of Strength. This initiative enlists secondary students and staff to work together to promote cultural change. The goal is to help students build their resilience and increase their connections with and trust in adults. Coeur d’Alene High students work on a mural as part of a wellness program designed to have teens from different backgrounds build relationships and friendships. About 250 middle and high school students and just over 50 employees of the district received SOS training. There are plans to train another 250 students and 50 employees in the fall and each year thereafter. Beyond training, there are relationship-building activities. Last week a diverse group of Coeur d’Alene High students hand painted a mural of words they considered meaningful, such as “family” and “optimism” and “thankful.” The murals will be posted in the school’s hallways. Though SOS was launched just two months ago, program coordinator Azure Wilson said she’s already noticed big changes. “I see kids who are different being accepted,” she said. The program draws kids from a variety of cliques into the same room to develop relationships and friendships. Sophomore Carson Magee said he is benefiting from the program after his school friend committed suicide last year. He said he has learned how to recognize depression and to understand anyone can experience it. “I want to learn more,” he said. Another initiative launched by the district in secondary schools is QPR, which teaches a simple method to intervene in and prevent suicide. It’s a way for community members (lay people) to be able to offer help in a crisis, sort of like the life-saving skill of CPR. The district has trained over 1,000 students and staff members in QPR. In partnership with Kootenai Health, 14 employees are now trained as QPR instructors, including Superintendent Steven Cook and eight school nurses. QPR is for handling the moment by asking questions such as “are you talking about ending your life?” The next step is to persuade someone to get help and follow up with referrals. Caudle, a 30-year educator, thinks more kids today than ever before are living in poverty, suffering physical or mental abuse or have mental health issues. 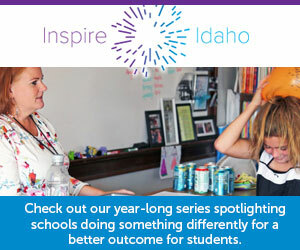 The other two initiatives launched in Coeur d’Alene schools are a tool kit for teachers and a program for kids. TBRI is a toolkit with strategies for teachers when interacting with students who have experienced trauma or other adversity. Coeur d’Alene is using TBRI through a partnership with the North Idaho Trauma Care Collaborative. Eight Coeur d’Alene staff members have been trained and the goal is to train everyone. Cope2Thrive is the fourth initiative and it teaches hope, and that both depression and anxiety are treatable. Five school nurses and one school counselor are instructors. Coeur d’Alene purchased program materials for individual student use. “We don’t want to have another loss of life,” Maben said.